Our Beer Worth Earning is a unique and tasty offering from Deschutes Brewery, Chain Breaker White IPA. It’s brewed a lot like a standard Wit Beer, the popular Belgian style brewed with wheat, coriander and orange peel. 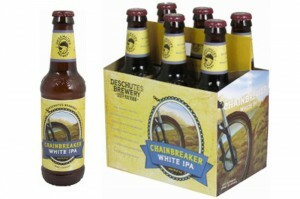 But Deschutes, a brewery well known for its fresh hop flavors, then adds an extra kick of Citra and Cascade hops to bring a citrusy and slightly piney bitterness into the mix. At 55 IBU, it’s not as bitter as your favorite IPA, but the hops give the refreshing brew an extra robustness. Here’s to your only chain breaker being this great beer at the end of your ride.